It was the luck of the draw, and luck wasn’t on my side. . .or was it? 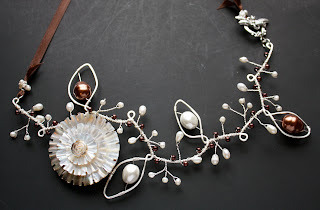 Because of the overwhelming number of jewelry artists that wanted to participate in Lori Anderson’s (of Pretty Things) 5th Bead Soup Blog Party, Lori opted to limit the blog hop to 200 this time around. This was perfectly understandable and reasonable. She went about it the fairest way possible. She let fate. . . and a randomizer pick the participants. Unfortunately, my number didn’t come up. For some reason I kinda expected this and was unfazed when I couldn’t find my name on the list. Lori encouraged those who didn’t get selected to play along and challenge themselves with something they had stowed away in their own stash that they’d been avoiding. I thought this was a fantastic idea and knew immediately which items I would use. For my birthday back in October, my dear friend Amanda gifted me with this beautiful Mother of Pearl flower pendant and large freshwater pearls. Before she even handed me the little box, she admitted, “I know these aren’t your usual style or colors, but they’re just so pretty I was hoping you’d still like them.” She was soooo right (does that girl know mw or what), they were definitely not something I would have bought myself, but I couldn’t help but admire the beauty of the pendant. I promised her (and myself) that I would make something with them. However, I put the box away. I did pull it out from time to time and remark to myself how lovely it was and that I really should do something with it. Yet, I was baffled as to just WHAT I would do. When Lori offered up the challenge to those of us who weren’t picked, THAT was the box I turned to. I pulled it out on my desk and have been toting it all over the state with me hoping an idea would magically spring into my head. And, it worked! As I was driving to the bead store on Wednesday I had a eureka-moment. 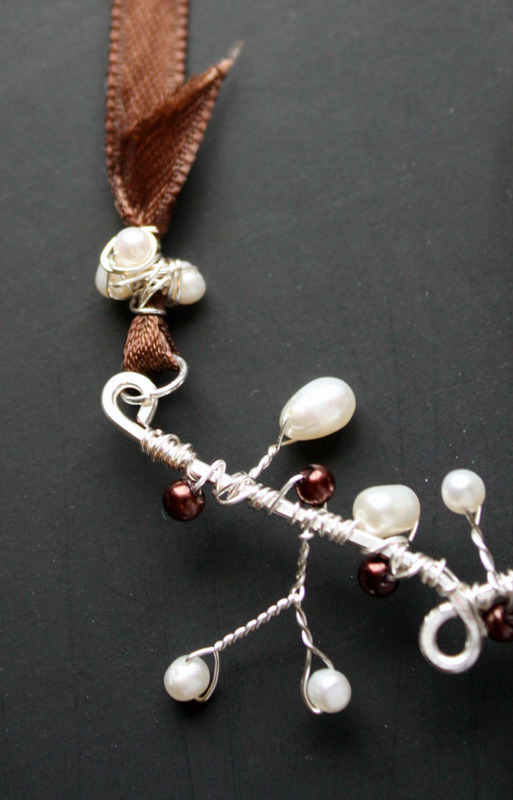 I used some 16g silver wire to form loops and 'leaves' then wrapped ivory freshwater pearls and chocolate glass peals on that with 24g silver wire. 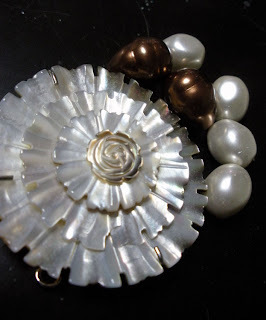 I wired the MOP flower pendant into place on the heavy gauge wire. Silk ribbon is used as the 'chain' of the necklace. It was secured with more 24g wire and some of the freshwater pearls. I improvised with the brown ribbon as I couldn’t find ANY brown silk in the area in the short time I left myself to work on this. I will replace it most likely if I do find some soon. A little closer look at the pendant and wire wrapping. As well on the upper right you can kinda see the dragonfly toggle clasp I used for the closure. I am absolutely SMITTEN with this design. While it’s not exactly as I had envisioned, it’s still absolutely stunning. I’m as giddy as a school girl (that’s a real saying, right?) over my results and so happy I waited to come up with just the right design for that pendant. Though I’m not officially part of the Bead Soup Blog Party this time around, I want to encourage you to check out all the other wonderful designers who ARE. Head over to Lori’s blog at Pretty Things for the full list of participants. You may also find a long list of artists like me who are just playing along. I can’t WAIT to get started hopping around! i was supposed to be in bed 2 hours ago. i didn't know it, but i think the universe was keeping me awake to see This Incredibly GORGEOUS Necklace You Created!!! Hope, you nailed it completely!!! This is so beautiful and wearable. I love the limited color palette-it helps draw the eye to all the details. FABULOUS WORK!!! Amanda is a great friend. 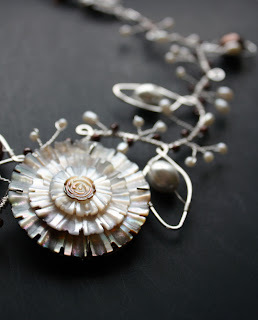 What a stunning focal you turned into an awesome necklace with pearls. Great work! Cilla- Yes, Amanda is awesome! I'm so glad you like the necklace. I had a lot of fun making it and am completely surprised at how well it turned out. Thank you so much! 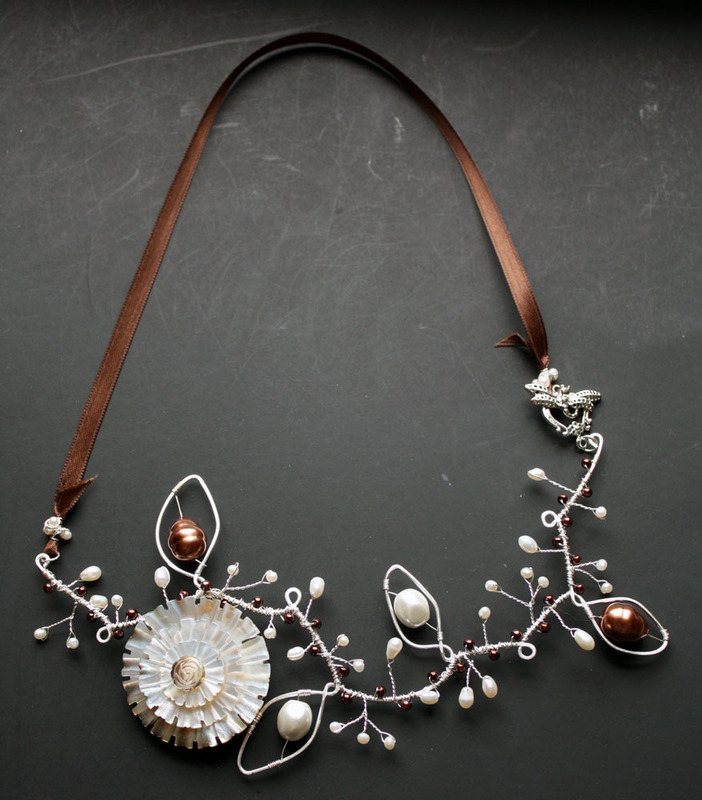 Oh Hope your necklace is gorgeous I love your creativity, imagination and skill in designing it. A true inspiration, I just love it!! Congratulations on doing some a amazing job!! Delicate and intricate and just plain beautiful. Cathie- Thanks so very much! I can't believe how well it evolved from a basic idea. I appreciate you stopping by! What funky fun you have made! I LOVE your design, and good for you joining in the fun. I'm so glad you did, and do appreciate your kind comments on my soup! This is stunning! I can imagine you are pleased with the results! I hope you are able to participate in the next bead soup-but how wonderful Lori was able to make you a part of the experience. Jeanette- Thanks so much. I shouldn't have a problem next time since Lori says she's staggering it so everyone can participate. I am really enjoying hopping around though and getting a taste of so much inspiration without having to worry about being a part of the real list. I appreciate you stopping in and checking mine out though! Beautiful necklace in beautiful colours! I really like the vine shape and the twisted beads (that is, beads on twisted wire). A very creative way of using a focal. What a gorgeous creation you have, I am inspired. Well who cares if you weren't drawn....look at that gorgeous gift!!!! ;) Your necklace in knock out gorgeous! Great work!! That is one unique piece. Is it comfortable to wear? It's great or at least this Southern gal thinks so. Stacey- Yes, Amanda really did me a solid with that gift! I'm so glad you like the necklace. That really means a lot! Thank you. Ginger- I'm guessing unique is good ;) In my opinion it's ALWAYS good. So, THANKS! As far as comfort, I wore it out Friday night and mostly forgot I had it on except for once or twice when I would put my arm straight in front of me and I could feel it move. I wouldn't say it was uncomfortable in the least though. Thanks so much for coming by and taking a peek at it! Well, I can tell you that if your inspiration had hit me, I wouldn't have been able to carry it out. That is some gorgeous wirework Hope, and I absolutely love how it showcases that beautiful pendant. You are such a creative lady! So glad you created a piece to play along. This necklace is stunning! I absolutely love it. The asymmetrically set flower is a fantastic design element. 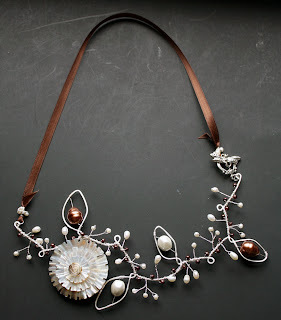 The nature design is right up my alley, in fact I was contemplating twisting the beads as you did, for my collar design. I opted not to because the collar needed durability as the base wire is aluminum. Oh how great (creative)minds think alike! Well done! Oh. My. Goodness. This is just beautiful! 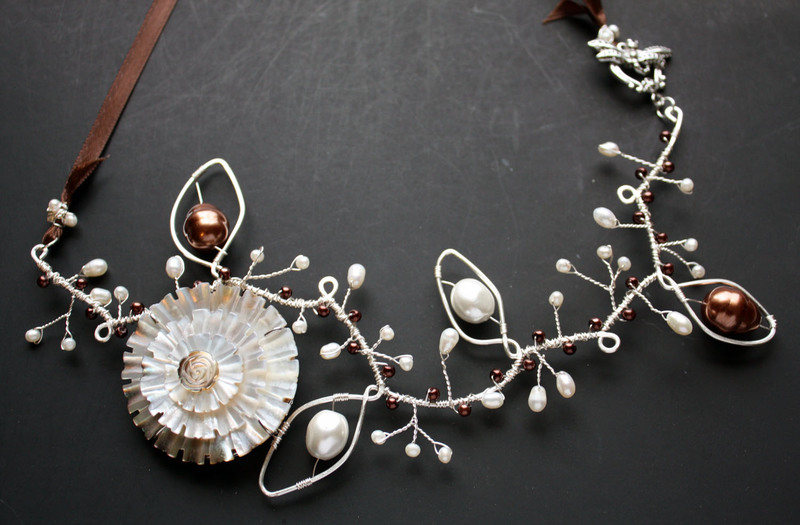 The wire, the pearls, the flower...yum, yum, yum. What a lovely stroke of inspiration you got hit with -- no wonder you're giddy! Oh, Crafty - that is pretty, pretty, pretty!!! You were so brave with that design and I love it! I'm so glad you challenged yourself to participate with us...I am totally impressed! Alesha- AWWW, thanks so much!! I'm pleased that I tried to do this as well. I would not have been nearly as satisfied with anything else. I appreciate you popping in! What a STUNNING adornment!! I'm in awe of all the wire wrapping that went into this piece. Beautifully crafted! This is absolutely gorgeous! I love how you brought it down to earth with the brown ribbon, for some reason that compliments the white and silver leaves in a modern but whimsical way. See you at the next bead soup where nobody gets left out!